With a powerful maximum brightness level of 5200 lumens, the ACEBEAM D46 Dive Light will illuminate your underwater adventures and can be used on land for search-and-rescue or another activity that requires a long, bright beam. 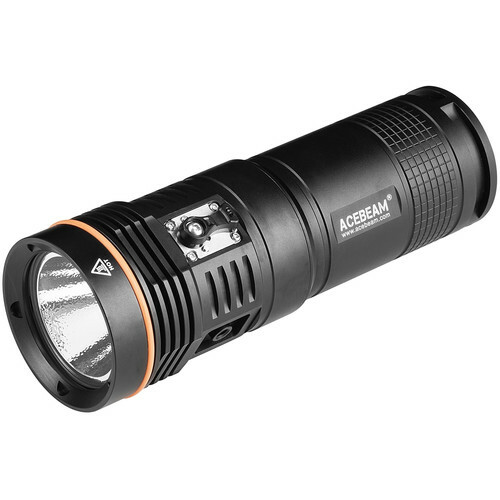 This versatile torch features four settings and an SOS signal and is depth-rated for 656'. A side-mounted compound toggle/push-button switch provides access to the brightness levels and strobe as well as a lockout function that prevents accidental activation during transport. Runtime on a fresh set of 18650 batteries ranges from 5 minutes at the 5200-lumen burst level to 15 hours at the 450-lumen low setting. The housing of the D46 is made of Type III hard anodized aluminum, with a copper base plate to help dissipate heat from that powerful LED. The 6mm optical glass lens features an anti-reflective coating for optimal light transmission. Operating voltage is 16.8 to 12, and a low-battery warning activates when voltage drops to approximately 12.8.